Newton's color circle is a convenient way to summarize the additive mixing properties of colors. R,G,B are thought of as the additive primary colors, and their complementary colors are placed across from them on the circle. The colors then fall on the circle in the order of the wavelengths of the corresponding spectral colors. Magenta is not a spectral color. 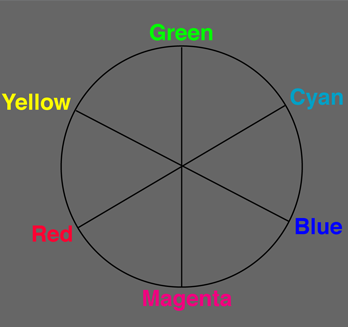 Quantifying the circumference of the circle in terms of hue and its radius in terms of saturation leads toward one of the formal color systems, the Munsell system. 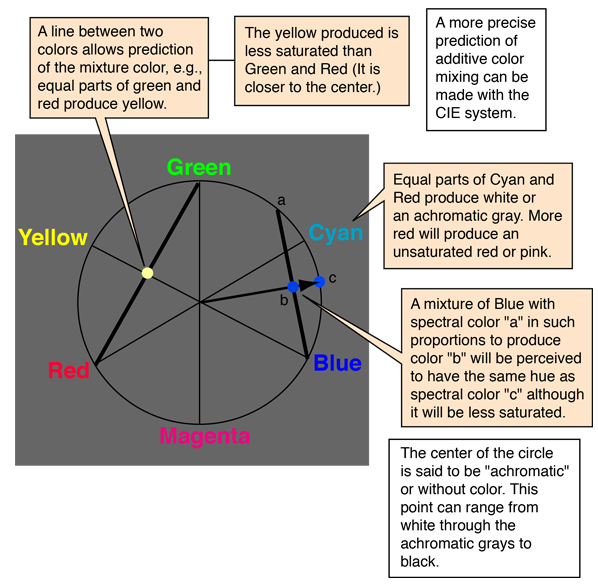 The color circle devised by Isaac Newton is a convenient structure for predicting the results of simple additive color mixing. The colors portrayed here are of course not to be taken as precise, but just as a general indication of color relationships.